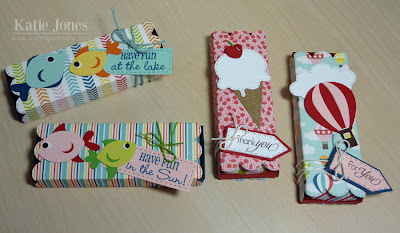 It's another 3-D Wednesday with My Creative Time, and I've got some summer treat boxes to share with you today! I made these to give to a few of my coworkers on the last day of school. Each one was made with the cute and easy My Creative Time Treat Slider Box and is filled with some Hershey's Nuggets. All of the patterned paper I used is from Echo Park's A Perfect Summer 6x6 pack. 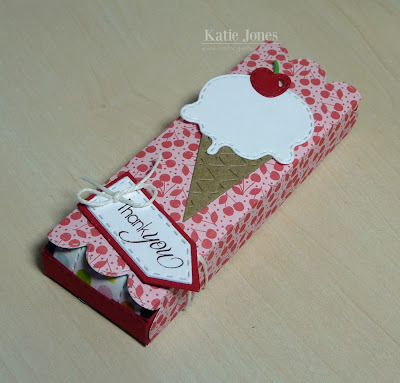 This cute cherry print inspired me to add an ice-cream cone with a cherry on top (made with MCT's Celebrate Good Times dies). 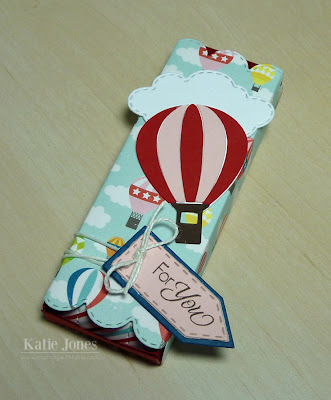 I also made a little tag using my favorite MCT's Teeny Tag Greetings and tied it with some thin hemp from Liz's Paper Loft Boutique. For this one, I used a cloud from MCT's Fly Away With Me Dies. One of the fun things about Echo Park is that they make die cuts that coordinate with their paper and sell them in the Silhouette Online Store. That's where I bought the hot air balloon cut. I also bought a cut with four cute fish. To make my tags on this box and the one below, I die cut rectangles using the Nugget cover in the Treat Slider Box and trimmed off the edges. Then I stamped sentiments from MCT's Have Fun in the Sun. Here's a look at the wrapped Nuggets on the inside. I love how Emma's signature stitching is on them! Be sure to click on the link below to check out what Emma and the rest of the design team have for you today! these are sooo adorable !!!! Love all your cute treat sliders!! Katie ~ Oh these are so ADORABLE!!! I LOVE how they are all different! Those fishies are way too CUTE! Plus I didn't know the ice cream die fits so PERFECTLY on that little treat box! 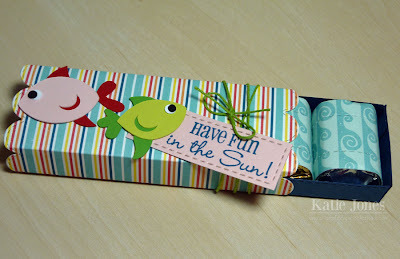 Plus I LOVE the paper ~ so bright and PERFECT for Summer! I bet they LOVED their little boxes! Your snack wrapper are just adorable gosh you sure came up with so many cute ideas. You sure know how to have fun thanks a million for sharing all your funness and cleverness. 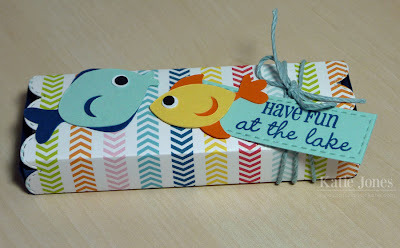 I bet you had fun making these cute boxes. Such great papers and cuts. Super job.